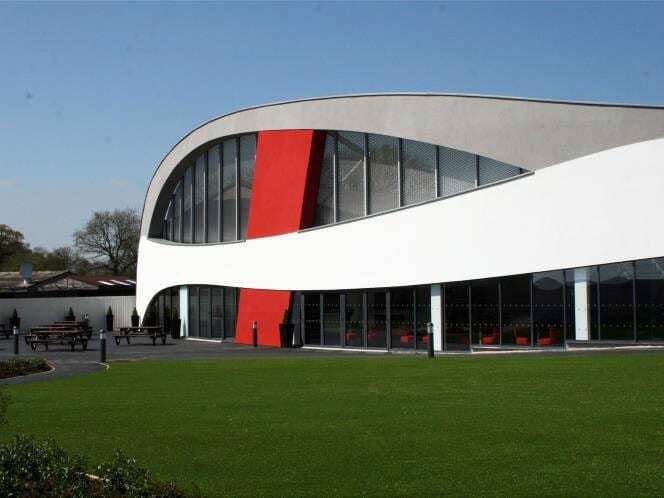 The new visitors centre at Haynes International Motor Museum was 6 years in the planning, and the Space team were there from the start alongside the Architects and the client, every step of the way, to help smooth the process. Haynes wanted a new function kitchen, a front-of-house servery and larger seating area to accommodate their growing visitor numbers. The new ‘Cafe 750’ derived its name from the first Haynes Manual ever produced, which was based on the Austin 750 motor car. This was a museum kitchen design with a difference. Space created lots of design ideas and visuals for the Haynes family and the catering team to help them develop the new foodservice area. Space even helped them to design the new restaurant logo. The scheme had to be bright, red and shiny, of course, to complement the ‘Red Car’ showroom theme. Space designed and installed a vibrant, bespoke servery counter with custom-made, self-service, chilled displays. As well as feature lighting, Space supplied a mix of furniture to break up the large seating area including formal dining tables and chairs, booths, and soft-seating for a more relaxed dining experience. To the back of house, Space installed a new wash-up area and large cold stores. A custom-made reception desk suite was also designed by Space to complement the servery area, and installed in the entrance hall of the museum. The Haynes family and the catering manager were delighted with the result and are working with Space on the next phase of development at the museum.